Have you heard about the Pinterest smart feed and how it impacts your exposure? Are you wondering what it means for your pins? With its new smart feed, Pinterest enhanced key features, which means you need to do things differently to make your pins stand out. In this article I’ll explain the Pinterest smart feed and how to use Pinterest’s changes to your advantage. Pinterest’s smart feed is a complex new algorithm based on the following elements: quality of your pin, quality of the source (blog or website) that the pin leads to and a rating assigned by Pinterest. Pin Quality: The highest-quality pins get moved to the top of the queue and stay there as long as the pin receives quality interaction (repins). It’s sort of like what Facebook does with popular posts in your news feed. Check the source of everything before you repin to make sure it matches the content. Pinterest Rating: Pinterest puts pins through a blender of criteria called the smart feed content generator. It chooses what they feel is best for the smart feed, based on the current pin and the performance of other pins from that source. Pins are placed best first, not newest first, into the smart feed. Pinterest no longer puts pins in your feed based on the time they are pinned. For example, users will no longer see 10 Mason jar pins in a row from a pinner who went on a Pinterest binge to fill up a certain board. According to Pinterest’s blog, the “best pins” are high-quality images that are clear and relevant; have minimal text and no borders; and include great, helpful pin descriptions. Here are five things you can do to stand out in Pinterest’s smart feed. Pinterest is the ultimate wish list. People pin and repin things they like and want. So think of your Pinterest boards as your visual portfolios, and make your pins as appealing as possible. This pin by Trey Ratcliffe is an example of the vertical crop on an image that appeals to pinners. Trey recognized this early in his Pinterest usage and began cropping his professional photos to suit the style of Pinterest. His 4.6 million followers love his photos. Optimize image sizes on your blog for pinning on Pinterest. Here are a few tips for how to make outstanding Pinterest images. Don’t overwhelm your image with text. Incorporate the text into the image. Tone down your logo. Rely on rich pins to brand your content and provide more information. Create a branded image for pins that work in tandem with your website or blog. That way, all of your images are recognizable and have your URL on them. Write descriptions with user-friendly language, and include keywords in the text. Beware: don’t stuff in keywords in that aren’t of value to the pin. Make sure the information is helpful, minimal and appeals to pinners. Plus, avoid overly salesy text. Include helpful information in your pin descriptions. This recipe rich pin uses simple text and provides in-depth information right on the pin. People are on Pinterest to learn and get inspired. Provide answers and ideas in your pin text. It gives people a good reason to repin and click through to your website. Seek out quality pins to repin and analyze your own pins using a tool like Tailwind. The Tailwind app offers enhanced analytics and detailed information on Pinterest pins and boards to help you discover what content is working. It helps you plan balanced content to spread throughout the week. I’ve created a list of tools and resources, including Tailwind, here for you. Tailwind analytics help you find viral pins, related pins and top pins to help with your Pinterest planning. Use Pinterest consistently and find pins that add value to stay on top of the smart feed, since both of those factors play into the algorithm. Make sure your pins link to a useful and relevant website. This pin has all of the essential ingredients of a great pin: great image, not too much text on the image and a fantastic description. Use text on your pinned images to give them context. At a glance, you can tell this pin has helpful information. Smart feed notices source quality, so be sure your pins (and destinations) are helpful and all content you repin adds value. Add the Pin It button and widgets to your blog to make it easier for your readers to pin. The more often your blog content is repinned, the better your pins will perform in the smart feed. Here’s how to make your blog Pinterest-friendly. Create an optimized, pinnable image for every post. Add the Pinterest Follow button to your website. Install the Pin It button for easy pinning. Use rich pins on your blog to add more meta data to your pins. 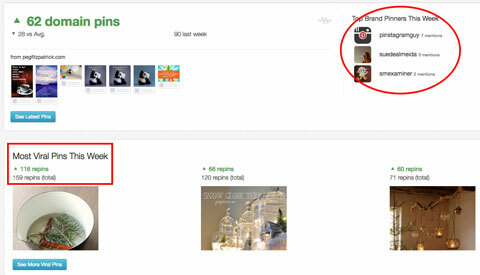 Add Pinterest board widgets or pin widgets for easy repinning. 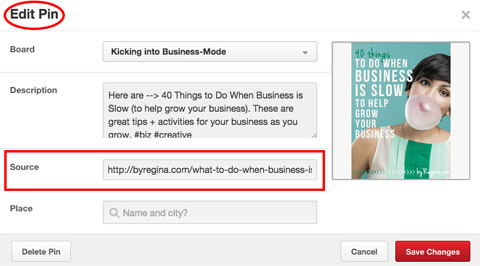 Use the Pinterest Pin widget to embed pins into your blog content to engage your blog with your Pinterest content. The widget builder is easy to use. If your Pinterest activity has slowed since the smart feed update, consider doing the following things to boost your Pinterest power. 1. Revisit old pins and update them with better descriptions so they’re more likely to resurface into the smart feed. 2. Add better descriptions to your Pinterest boards to make sure that you have solid, searchable text. 3. Be more active on Pinterest and pin on a regular basis. 4. Share your pins from Pinterest to other social media platforms and invite your networks to follow you on Pinterest. 5. Apply for promoted pins with your business account. Pinterest has changed their discovery engine in an effort to provide an even more beautiful experience for pinners with their smart feed. If you pin high-quality content on a consistent basis and use all of the tools that Pinterest provides, you’ll find yourself in a prominent place in the smart feed and get repinned over and over again. Pinterest is a wonderful platform for marketing your business. Make the smart feed work for you. What do you think? How do you get your pins noticed? What tactics do you use to show up in the smart feed? Which of your pins gets the most repins? Share your thoughts and suggestions in the comments. Originally published on Social Media Examiner. Excellent Post Peg! Tieing pins to relevant web content is so simple, yet some people still send pins to their home pages. Still baffles my mind. I love the last tip you give here about revisiting old pins! A lot of people and brands forget that an old pin doesn’t lose it’s life expectancy. Things like rewriting your description or repinning the original post with a new image can help improve engagement rates on Pinterest. The same goes for any posts on social media. Go back through old posts, retweet them on Twitter and leave a new comment on Facebook! Bring new life to old posts! Thanks for the great tips, yet again, Peg! This is such an easy to follow instruction for anyone – Really Great info in this post! Thanks for always verbalizing your thoughts in a easy to digest format! Great post Peg, especially the point on branded images. You even took one step further and customized your Pin It button to fit your brand! Are there any plugins you would recommend for that? I’ve installed the the Pinterest Widget’s pin but I’m not sure why it doesn’t work very well on my own websites. Very useful post. You are a Pinterest marketing queen. These tips will definitely helps me in making my post appear in smart feed. Excellent Post Peg! Tieing pins to relevant web content is so simple, This is such an easy to follow instruction for anyone – Really Great info in this post! Peg – is there any benefit to including a “Place” in the pin details? I want to drive people to my physical business location. Thanks for all the amazing tips!